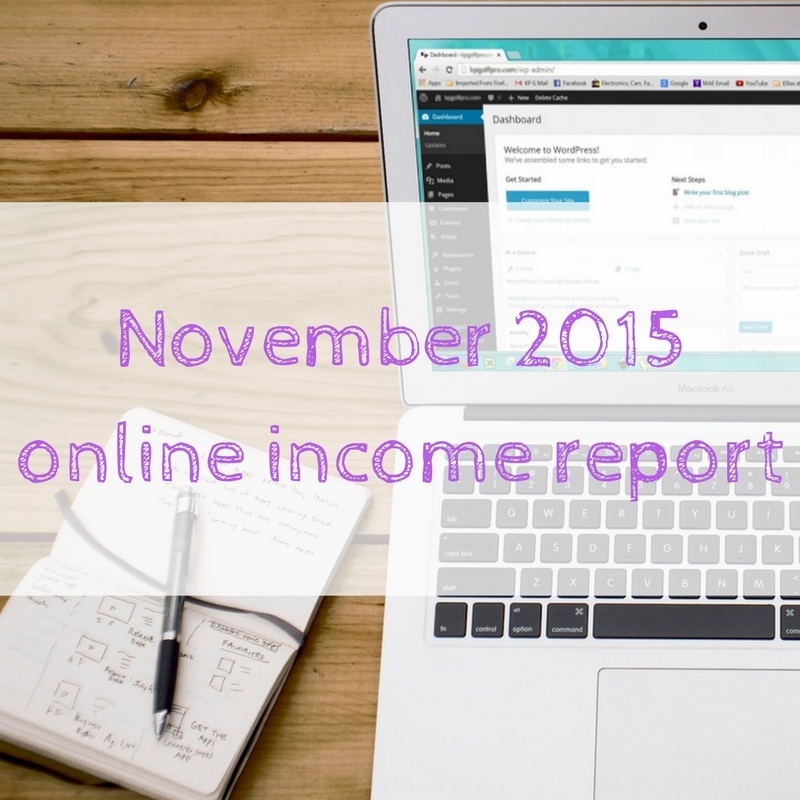 Hello and welcome to November 2015's monthly income report. I am finally fully self employed! 20th November was my last day at work which means I have enjoyed ten days of the self employed lifestyle in November and so far I am loving it! Of course ten days isn't long enough to let me know if I really like it, but it has been a good start. However, I did have tonsillitis for over two weeks which really made things difficult. 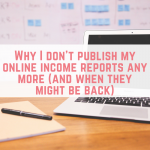 Publishing my income holds me accountable to you, my readers. I want to achieve, I want to earn and quite frankly, I want you to congratulate me! I am able to look back at previous months when I need some more motivation or ideas to continue. Most importantly, I want to tell you how you can be making money! You might just want to make enough to cover your holiday spending money or you might want to quit your job all together. Whatever your financial needs are, you can earn extra. You can check out October's earnings here. In November we have continued working alongside each other as a couple. Tony still isn't back at work following his knee injury, and now that it has been over 3 months we are starting to get worried about whether he will ever be able to return to his job. 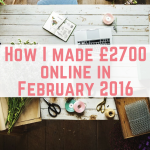 I am really thrilled that we met our goal of £2,000 this month before we added our matched betting income. 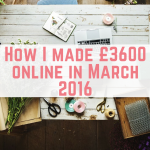 I love matched betting a lot, but I don't like relying on it for income. 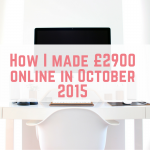 So here you have it – my extra online earnings for November 2015. This is money I have earned this month – some of it won't be paid for another 30-90 days though. 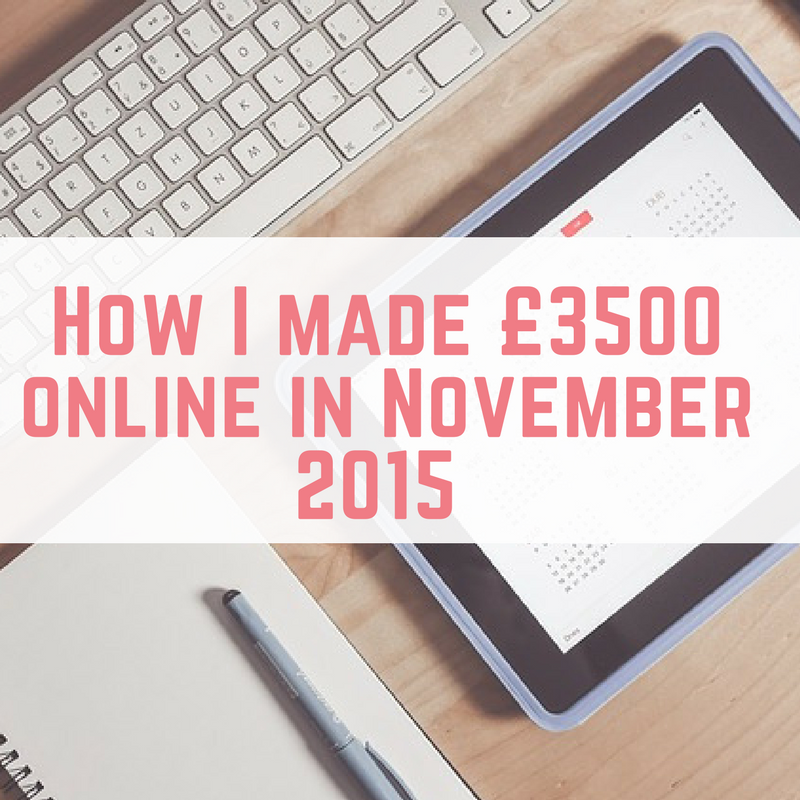 I feel as though I am going to blame tonsillitis and time for all my shortcomings this month, but I felt as though matched betting really took the back seat in November…but it turns out that it hasn't! It remains our single biggest earner and I have had a great month with offers. Two bookies have “gubbed” us, which means we can no longer claim the free bets they offer, but this still hasn't impacted our earnings too much. Remember that matched betting is a tax free, risk free and legal way to earn some extra cash. Affiliate earnings have continued to be a big earner in November, in fact there is a great improvement on October's affiliate earnings. I really wanted to utilise Black Friday and post lots of offers, but both time and tonsillitis were against me (there I go again, blaming the same two things!). However, I am really happy with November's earnings, and I am determined to increase this in December. 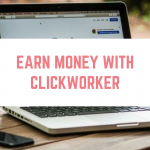 There is still one program that out performs the others (with £763.98 coming from one program alone) so I want to look at more ways to promote this, but I also realise the importance of improving my other affiliate earnings. Between us we currently have five websites, all earning us an income from various sources. These earnings are for non-affiliate earnings – so sponsored posts and advertising (through Google's Adsense). 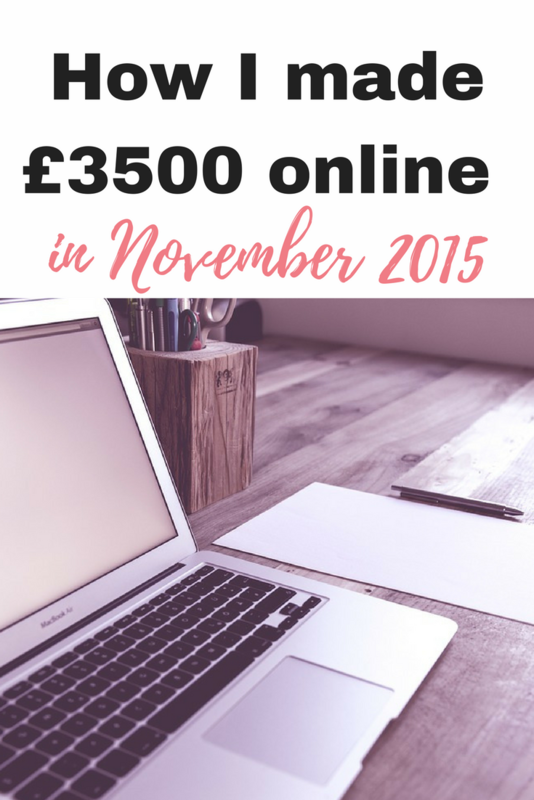 November saw the websites earn £584.91, which is the total received for advertising and sponsored posts (after fees). Last month I removed media.net adverts from From Aldi To Harrods, and I have seen a great improvement elsewhere. Some of the things I do, such as Instagc and Swagbucks and even some sponsored posts here pay out in gift vouchers. Whilst this isn't cash in our hands, we still like to count it. In November I earned £105 in Amazon gift vouchers. This amount is NOT included in my income total for this month. Prolific Academic continues to be my favourite survey site by far, with another month of over £40 coming from Prolific Academic. It was followed by a few payments from MintVine. I have cut down the number of online surveys I complete and this shows in my income from them. “Everything else” comprises of just that, everything else! November has been a real mish mash of things earning me money. I completed an offer at Topcashback, where you deposit £10 into a bingo website to get £26.25 cashback – so an easy £16.25 profit. I then went on to win £152 at the bingo website! 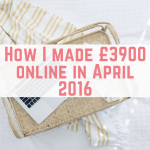 I had similar success with the Booty Pirates offer which has really helped to boost my income. I also have two freelancing clients covering 10 hours a week, which I am hoping to grow in 2016! Having regular clients helps me to plan ahead as well as having some guaranteed income. My book sales have been slow and steady, I offered my book for free for 5 days around the Black Friday weekend, which helped to boost sales. Buffer to schedule my social media posts. Postage for eBay sales and competition prizes. 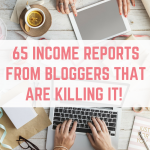 I have seen other bloggers include their most popular posts from the previous month, so I am excited to share mine with you. These are a mixture of posts that were published in November as well as previous posts that have been popular in November. I can't believe that I have smashed my target for another month – and not just by a little bit – by over £1,000! This really encourages me and I am so glad I made the decision to leave my job. I am struggling a little with knowing when to stop working and setting boundaries. December is going to be another busy month and I can't wait to see how the earnings turn out. 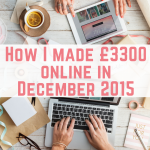 My goal for December's earnings is £2,500. I would have preferred to leave this at £2,000….but I thought I would try to challenge myself! I've got a lot going on in December, with my blog anniversary giveaways, Tony's birthday was on the 1st and obviously Christmas, so my only plans are to keep ploughing on and start thinking about our big plans for 2016! Another amazing month for you, you are such an inspiration wish I had a fraction of your’e motivation ! Sorry to hear about your tonsils – I had mine out when I was 30 and would recommend it if you can get your GP to agree. I have also sent a request to join your Facebook match betting group as I am not earning hardly anything match betting and I have completed most of the sign up offers now. I thought I was keeping good records too :-/. Wow what a brilliant month!! Don’t forget you can claim a % of heating, elec and internet bills when you work from home. Hi Shane, I’ve tried 2 other paid sites and MSE, and for me PA offers fantastic value for money.